Properties in Town of Bethel average 4.7 out of 5 stars. Property 2: Relaxing Lakefront, Quiet, Private, Very Clean. Great for Groups and Families. Property 5: Beautiful Cabin On 5 Acres. 2.5 Miles From Bethel Woods and Villa Roma. Property 6: Catskill Bungalow with pool , outdoor fireplace. The Homestead: 14 bedroom lakehouse in scenic Catskills town by Red Cottage Inc.
Property 11: The Homestead: 14 bedroom lakehouse in scenic Catskills town by Red Cottage Inc.
Beautiful Catskills Cabin in Private Lake Community! 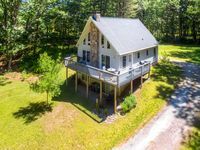 Property 12: Beautiful Catskills Cabin in Private Lake Community! 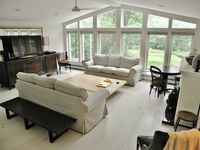 Amazing 4 BR Catskills Oasis with Pool -- sleeps 10-12! Property 19: Amazing 4 BR Catskills Oasis with Pool -- sleeps 10-12! LUXURY RETREAT ON THE LAKE - HEATED SALTWATER POOL-JACUZZI-BILLIARDS(5,300 SFT)! Property 20: LUXURY RETREAT ON THE LAKE - HEATED SALTWATER POOL-JACUZZI-BILLIARDS(5,300 SFT)! Funky Catskills Farmhouse on 5 acres with pond and woods. Property 22: Funky Catskills Farmhouse on 5 acres with pond and woods. Property 24: Lakefront Catskills Lodge!!! Cozy Enchanted 12 x 12 Cabin - 5 miles to Bethel Woods with Breakfast for 2! Property 29: Cozy Enchanted 12 x 12 Cabin - 5 miles to Bethel Woods with Breakfast for 2! *NEW Poconos home with Delaware River views! Property 33: *NEW Poconos home with Delaware River views! Property 34: Family Friendly Cozy Cottage by Small River in the Heart of the Catskills . Catskills NY/Casino, Bowling, Car/Horse race tracks, nature trails are the best! Property 38: Catskills NY/Casino, Bowling, Car/Horse race tracks, nature trails are the best! Property 39: 2BR Callicoon House on Delaware River! Property 40: Contemporary Lake House Getaway - 5 Acres - Lake Front / Pool / Activities! The moment we opened the door, the stress level was gone. Perfect, romantic getaway! Scenery was just lovely. we enjoyed the views from the living room and loft, which was a treat! Overall it was very clean. I would recommend this to any couple looking for a romantic getaway. This was a surprise to my girlfriend and she was extremely happy with this getaway! This is the perfect place for a winter getaway.